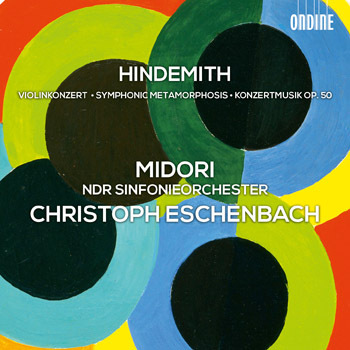 Ondine proudly presents a release of works by Paul Hindemith (1895-1963) featuring Midori, the NDR Symphony Orchestra and Christoph Eschenbach and commemorating the anniversary of Hindemith's decease 50 years ago. Paul Hindemith's Violin Concerto was premiered in March 1940 in Amsterdam and already one month later the American premiere took place in Boston with the composer being present. Hindemith's extensive experience as an orchestral musician and string soloist gets clearly obvious in his Violin Concerto and he proves to be a connoisseur of the tonal possibilities of the instrument. Not for nothing he wrote to his publisher: "In any event, it is essential to send the solo part to the soloist of the concerto in Amsterdam as soon as possible, so that the poor man can practice." Hindemith's Concert Music for String Orchestra and Brass Instruments, op. 50, was commissioned by Serge Koussevitzky for the Boston Symphony Orchestra and its première a great success. The Symphonic Metamorphosis is one of Hindemith's best-known orchestral compositions that he even conducted 27 times himself. Midori is nowadays recognized as an extraordinary artist personality, a devoted and gifted educator and an innovative community engagement activist. Making her debut at the age of 11, she celebrated her 30th year on stage in the 2012/13 season. She teaches at the University of Southern California and adds substantial time periods to community engagement programs she has founded. Her broad discography was awarded with many prizes and her enthusiasm for playing and supporting the music of different times up till today can be seen on her CDs and in her concert repertoire. The NDR Symphony Orchestra, the orchestra-in-residence to-be of the Hamburg Elbphilharmonie, can look back on a continuing line of important conductors that have formed the orchestra, such as Furtwängler, Böhm, Tennstedt, Wand, Gardiner and Christoph Eschenbach, just to name a few. Nowadays its Chief Conductor is Thomas Hengelbrock and Alan Gilbert holds the position of the Principal Guest Conductor. Known as pianist as well as conductor of its own league, Christoph Eschenbach has performed worldwide as regular guest of great orchestras and opera house. An impressive discography, several prizes from early age on and triumphant appearances, lately on a tour with the Vienna Philharmonic orchestra, illustrate his amazing career. Versatility, innovativeness and passionate drive have earned him worldwide recognition as conductor, artistic partner and energetic supporter of young musicians. Since 2010 Eschenbach has held the dual post of music director of the John F. Kennedy Center for the Performing Arts and the National Symphony Orchestra in Washington.